The Circular Economy Package consists of an EU Action Plan for the Circular Economy (PDF) that establishes a concrete and ambitious programme of action, with measures covering the whole cycle: from production and consumption to waste management and the market for secondary raw materials. The annex to the action plan (PDF) sets out the timeline when the actions will be completed. The proposed actions will contribute to “closing the loop” of product lifecycles through greater recycling and re-use, and bring benefits for both the environment and the economy. The revised legislative proposals on waste set clear targets for reduction of waste and establish an ambitious and credible long-term path for waste management and recycling. Key elements of the revised waste proposal include: A common EU target for recycling 65% of municipal waste by 2030; A common EU target for recycling 75% of packaging waste by 2030; A binding landfill target to reduce landfill to maximum of 10% of all waste by 2030; A ban on landfilling of separately collected waste; Promotion of economic instruments to discourage landfilling ; Simplified and improved definitions and harmonised calculation methods for recycling rates throughout the EU; Concrete measures to promote re-use and stimulate industrial symbiosis – turning one industry’s by-product into another industry’s raw material; Economic incentives for producers to put greener products on the market and support recovery and recycling schemes (eg for packaging, batteries, electric and electronic equipments, vehicles). The EU adopted new initiatives to increase the level of recycling and moving towards a circular economy. 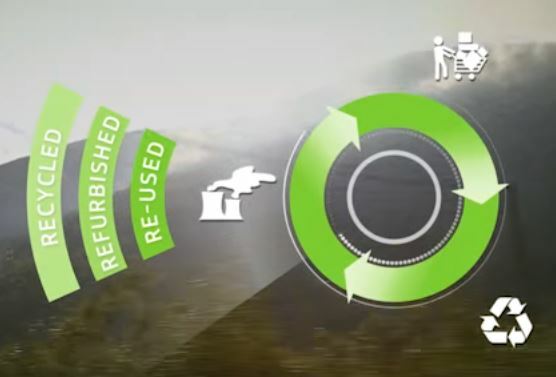 Circular economy is a system that optimizes the flow of goods and services to get the most out of raw materials and cuts waste to the absolute minimum. Using resources more efficiently will bring new growth and job opportunities.